Rich and Linda Peters loved the 1929 Spanish colonial revival-style bungalow they bought several years ago, but not its dark, poorly remodeled kitchen. “There was no real work triangle, the windows had been partially covered with gypsum board to create inside arches, and there was a stairway leading from the back of the kitchen down to the garage level,” says Linda, one of Sunset’s photo editors. The couple wanted to preserve and enhance the architectural style of the house while opening the kitchen to the outdoors. They moved the stairway to a more central location at the back of the entry hall, which made room for a 10- by 8-foot kitchen deck that’s accessible through French doors. And they removed the gypsum-board arches, allowing the original windows to flood the room with light. Working with architect Torin Knorr, Rich, a professional builder, designed and crafted the new interior. The doors of his off-white cabinets are a combination of wood and glass, allowing Linda to display her colorful collection of Bauer and Fiesta dinnerware. The Peterses selected concrete counters, a farmhouse-style sink, and a long center island with a butcher-block surface and deep overhangs on three sides. While pewter hardware and a bead board-trimmed island and backsplash lend Old World charm, the kitchen has carefully conceived accessories, including a pull-out pantry, a divided drawer for cutting boards, recycle bins, deep drawers for cookware, and narrow drawers for pan lids and spices. 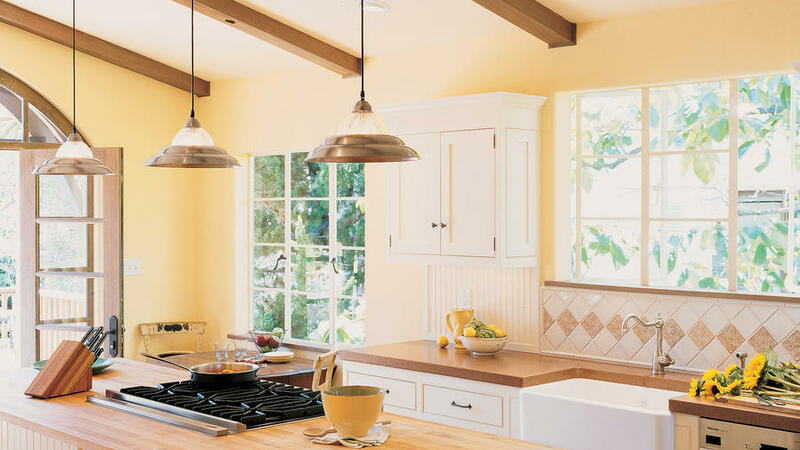 Buttery yellow walls, stained wood beams, and hardwood floors give richness and warmth to the kitchen. “Now we love to gather here with friends,” Linda says.